We're sure that you must be familiar enough with Angry birds game, it's the most successful multi platform games today, but how did it feel to play the real life angry birds game by using a pumpkins? This 12 years old guys Sam Beards, which is the truly angry birds fans in England, manage to made his own version of Angry birds by using a pumpkins. Here's Sam Beards story about how he managed to made a real life angry birds game. It's really a great ideas for this Halloween guys. Just like millions of people around the world, Sam spent hours every day playing Angry Birds on the tiny screen of his iPod, but when he got the idea of making a real-life adaptation of his favorite game using a pumpkin cannon his father built last Halloween, he jumped at the opportunity. In Angry Birds, players have to shoot various types of birds at their mortal enemy, the pigs, using a slingshot, but in Sam Beads version, people use the giant cannon to shoot pumpkins painted as the popular birds at other pumpkins painted as pigs. Sam’s siblings, sister Jessica, 16, brothers Ben, 14, and Davy, four, with their father Dorian are in charge of painting the pumpkins as Angry Birds characters, and Sam fires the compressed air cannon that can shoot a pumpkin up to 500 meters. ‘They had a great time firing the pumpkins at pretend targets. I think we might make this a regular event and get the customers to join in,’ Sam’s mother, Fiona, says. With the ever-growing popularity of Angry Birds and the media coverage this story is getting right now, I’m pretty sure the Beards are going to be overrun by tourists this Halloween. Now, if you’ll excuse me, it’s time for my daily Angry Birds gaming session. 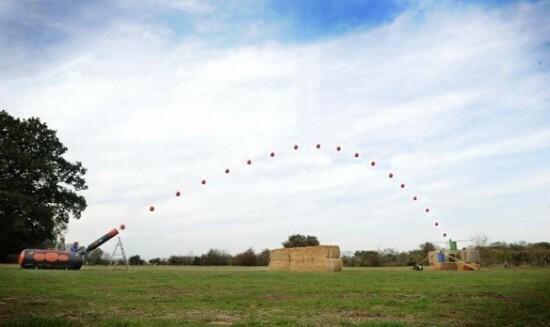 watch the real life angry birds game by Sam beards below.